I will delete this democratic app from my phone today , you have no respect for the president . He is our president the people voted and I’m a minority . Build the wall protect our borders .!!!!! The app for my iPhone worked much better prior to the last update. Besides the fact that the newsfeed is only updated once a day, seems like it anyway, the scrolling is so slow and sketchy, you don’t want to deal with. The fix: go to Google news, BBC, New York Times, anywhere but here, to get your news. Poor layout , bring back the one from a year ago. Video starting on their own. Corrected my issue in settings regarding video starting on their own. I honestly feel sorry for your newscasters who I’ve been watching for years. They are the reason I’m having a hard time weaning myself off your local news. Your coverage of local news is very exploitive and obviously focused on ratings. Your national news is very biased and probably a reflection of your “head” person who has political aspirations. Anyways, I’m probably not the only one leaving... just having a hard time going to another channel cause I love your newscasters. Lately when I am watching the news video I hear an ad in the background. I know this must be extremely embarrassing for a multibillion-dollar corporation and only takes some IT kid maybe a day to fix this issue. Please fix this, it's extremely irritating trying to watch a News video and hearing a Dodge ram ad playing in the background at the same time ________________________________________________ I reported this beginning of the year and now it's August 9th, 2018 and I'm still experiencing it. Any chance the CEO has it in his budget to hire some kid out of college who knows about coding and programming, to correct this issue? To many ads and not enough content. Deleting this app. This app tends to crash often when clicking the news article. This app just stopped working unless i register now. Traffic icon should be easy to find. App does not update to current conditions quickly. Example: At 7:00 this morning, it is still showing me the weather from yesterday afternoon. This is the rule not the exception. The newsfeed is not always up to date. Takes too long to swipe through all of the news to find the one you want. Images won't load anywhere let alone videos. The updated app is absolutely horrible. It is not user friendly at all and makes it nearly impossible to use. The format is distracting. It feels more like a low budget entertainment app than what you would expect from a respected news outlet. I can no longer navigate to find updates on Eye on LA, GMA or the ABC National headlines. 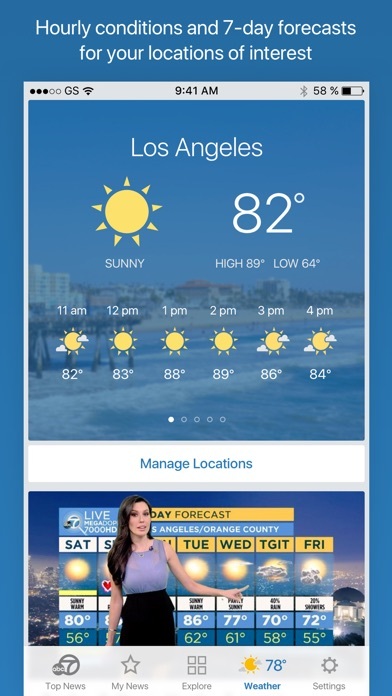 Extremely disappointing that I can no longer use ABC’s app as my go to for Southern CA updates. Please change it back. Simply put the original layout and operating version was much more intuitive. What used to set this app apart from the others was the ease of finding the traffic map feature. Now it takes too long to find it, if you ever do or give up. I liked that I could look at multiple headlines and pick what I wanted to read, now you have to scroll down through everything. If I wanted to do that I could just go through my Apple news feed. Think I’m done with this app unless they change it again. Don’t download the update!!!!! I like it but it is totally biased. As another user said, living in CA you expect completely one sided and biased news, but I wish they’d stick to facts. They are clearly left-leaning as they take any chance they get to bash the president. I’m not saying I need or want to have pro-trump news. I’m simply saying I’d like news that is neutral! ABC 7 is not neutral in any way shape or form when it comes to politics. There are people in this state who are right-leaning believe it or not, and I wish they’d stop catering to the left and be fair. Politics aside though, I do like having this app. When I compare it to other news apps in different states, they definitely are more professional and give great info on local stories and they keep updating them as new details emerge which is nice. 2 stars because I’m disappointed and sick and tired of biased news. Note to all readers: please do your own research. Don’t trust ANY media to tell you facts. Find facts for yourself and make your own informed decisions. I no longer use this app due to the new format. I generally like this news application with the exception of looking at the embedded photos. When viewing on my iPhone X, I cannot close the photo due to the “x” for closing the pop up is to the right of the top sensor notch of the display and is not clickable. I have to force close the app to & then relaunch it to get back to the story I was reading. Not a big deal but at that point I just move on to another one. I’ve contacted them via the support a few months ago and did not hear back from them & as of today it still has the same problem in the UI. Where is your traffic ? Will not use anymore. This used to be the best news app. Then they changed the format making it difficult to scan for the topics that interest me. Now I’m using NBC’s app. Lesson for ABC7 - “Don’t fix what ain’t broke”. Have had nothing but problems with the new format. 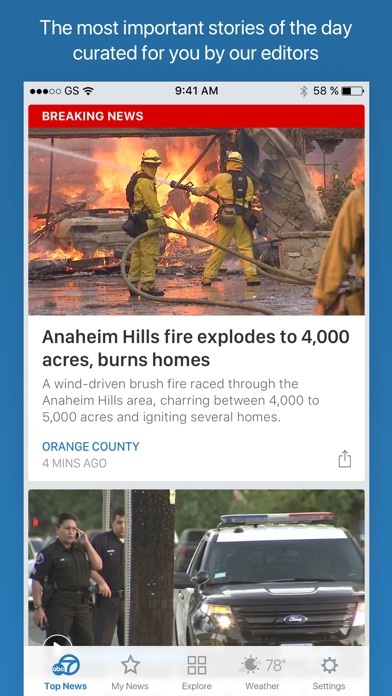 Trying to get news about the current fires and the app crashes every time I open it. Should restore to the old format which was much more reliable. New app revision looks lousy, loud obnoxious ads constantly pop up ( that’s really bad for us early risers). Can no longer just scroll thru to see what’s happening and what u want to read more about. I’m done w ch 7. It should be called an ad not an app. For every story you want to watch, you first have to watch an ad. It’s frustrating. Plus, it’s almost 10 pm and the most recent “live” weather report is from the morning. KABC- Please look at the app ratings since the November upgrade. Mostly positive before the upgrade, now mostly negative reviews ...one star. Everybody is complaining about the same issues. Dump this “New Coke” and go back to “Classic Coke”, please! The new app format is terrible. I used to be able to glance at the app a few times an hour to look for subject matter I was interested in. Now I need to scroll through the whole series of stories, mostly subject matter that doesn't appeal to me, to find a topic that I would be interested in. Now I look at the KABC7 only once or twice a day. Swallow your pride and please revert back to the previous format. With iPhone X you have to quit app when viewing images because the X is partially obscured preventing clicking on it. 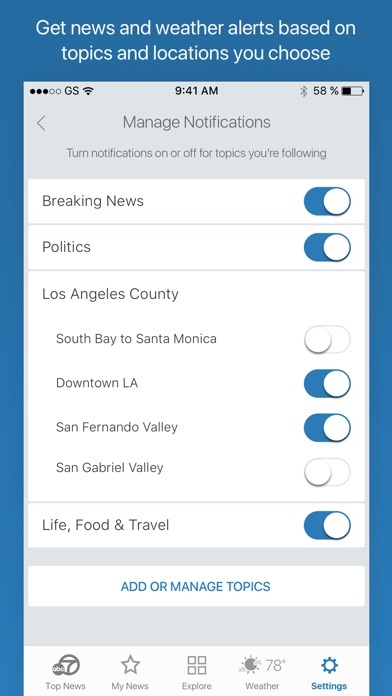 I’m going to start using another news app. The videos never work, on the other hand the ads in the beginning of the video work perfect but never connects with the news video. Also, the copyright date is 2017 makes me think that this app is neglected. Bring Back the Old App ! This new format is annoying and not user-friendly at all ! I agree with the other users this used to be my go to for news but no way ...not anymore... you just ruined it ! Why change was seem to be working fine ? This new format does nothing to add to or increase the viewers reading, in fact, it takes away from it immensely ! Change it back or we will both be sorry! I like this customizable aggregator of news and events. I’d give 5 stars if there was more O.C. News. You will spend more time watching advertisement commercials than watching actual news on this app. Further, the new lay out is awful. I listen to a lot of talk radio. If I open the app , it closes the show I was listening to. Deleting this app! Hate the new app.. Love channel seven news I loved loved loved the last app everything was on the front page for access to what you need for quick reference. New app quick access is hard to find you have to search for what you need. HATE THE NEW UPDATE!!!! Used to be so easy to use. Now I can’t even find the traffic!!! I used to love this app now I opened it and have no idea where to go. Can’t find my traffic information quickly!! 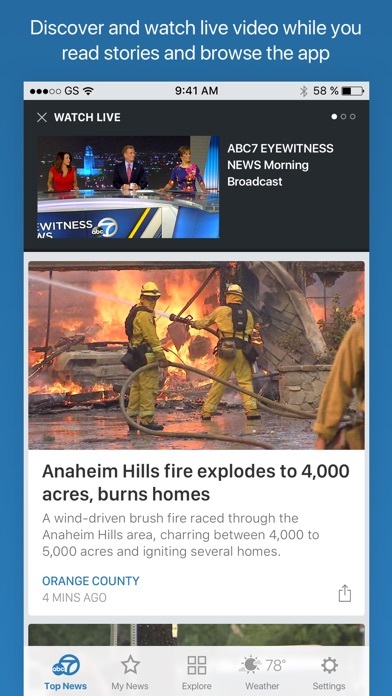 This is the only news app are used for Southern California for many years. Within the last month or so the entire format was changed and in my opinion the app has lost its appeal. The old app you could open it and choose from many different stories where is this app you actually have to search to find a story worth reading. I would much rather open the app and have many stories to choose from rather than a few and then have to search for the rest. As such, for the first time I have downloaded NBC and Fox. This was my go to app for so much. News, Weather and Traffic which is the most important thing in the morning to me. This app use to be so easy..please fix it!! Back to the old format! The new format is terrible! Go back to the old one--so much easier to use and find what you want. And uses too many resources on my iPad - it’s now become useless and I’m deleting it. The latest update keeps playing annoying ads with every story. It’s so bad I simply turn them off for each. What happened to letting us read in peace & quite? Do not care for the latest update by this app, will be deleting it! Very disappointed in the new format.its easy to miss articles. Just not happy with it..too many advertisements also..this app is not even worth 2 star. This used to be my go to app, opened it on the daily in place of actually watching the news on the t.v. Until a couple of days ago when they decided to update it, worst update ever! The old format was so convenient and easy to maneuver, now you can only view one story at a time and it keeps playing the videos for the stories I don't want to watch. Honestly I don't think I have even figured out how to work it correctly. It shouldn't be this annoying to try to read the news. Now I'm in search for a better news app that's easier to manage! Much better before having the traffic icon at the top. I hate new update. Unable to find videos on breaking news and earthquakes with new format. This one is awful! I keep deleting and will do so one more time. Ill enjoy the Bay Area one while I can then go another network. Bad job ! With the new update the layout is horrible. Loved the old app where you could see all on one page. Now you have to scroll through some small little squares by county. I cannot find a setup configuration that presents the news in a useful way. I can’t find anything. The current app is a piece of junk. Really don’t like the new layout. Please return to previous layout. What happened to traffic map? Where do you gave to search to find it? Don’t have time. I used to like this app, but the recent update made the format absolutely terrible. Going to delete it. This is my first review but am writing because though used the old version for years am ready to hit delete. Bring back the option to see simplified view of all headlines as opening view. All the scrolling leads to inevitable and unintended clicking on noisy ads and reduces efficient news reading. old app much better. miss traffic map and ability to click on location for Ventura County news. Also if listening to music, opening this app blocks my music stream. This app is awful!!! HATE IT!!!!! You need to go back to your old app!!!!! This app is the worst!!!!! I seldom delete apps but I have to I can't have my music turn off everytime I try to read the news in this app. No one can watch all those videos and if we could we wouldn't be turning to this app we would watch the actual news. I'm super disappointed. Most of us use this app at work or class or places where we want to know quickly what is happening. ABC 7 please please change the format !! I want my app back. The upgrade to the app is horrible. The old version used to be my go to for local news, now with the new version, I need to look someplace else for news. I gave it 1 star because it wouldn't not let me leave it blank. 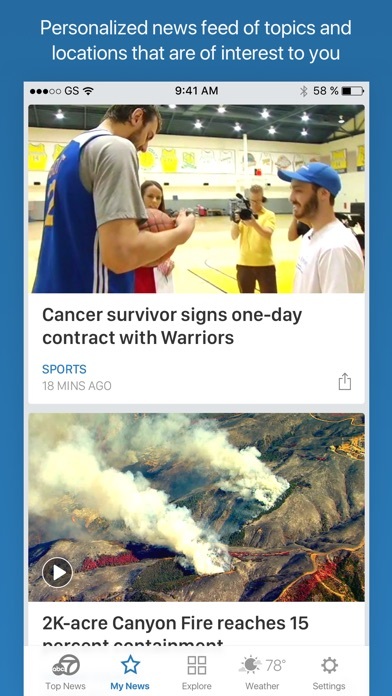 The news stories are not laid out in a way to where they are easy to see the highlights and it is super annoying that when you pull up the app it automatically starts the video, considering I like to read the news late at night/ early in the AM lying in bed and don't want to wake my husband. If you like commercials, this app is just for you!!!!!! **update** decided to re-lower the rating back to one star. Imbedding videos in the app only to have them cause it to continuously crash is not acceptable. As well as the increase in advertising imbedded in every story, now takes so long to load, you can start reading a story, get a couple of paragraphs in and completely lose your place and have to literally scroll to search and find where your current paragraph has been repositioned to on the page...it might just be time to delete this app, it gets worse over time, not better*** Only being able to watch uploaded/pre-recorded video in landscape, while live video must be watched in portrait is just stupid. And the audio....why is this the only app in the world that forces you to switch off vibrate mode to enable the audio? Even YouTube fixed that... And while this is a review for the app, you would be given a 0 or no stars if I were to take into consideration your obviously non-objective, clearly left leaning spin on stories. Oh how I long for the days when journalists just told the story while sticking to the facts, without all the "ketchup & mustard" or "salt & pepper" peanut gallery opinions. Even the stories when you're appearing to be objective verbally, while conveying contempt or an opinion through inflection and body language and think nobody sees through this...but I digress, it's only an app review. So pretty much all the same gripes remain, but they are occurring with more frequency which is why I lowered the rating back to only 1 star. This app jumps all over the place when I’m trying to read a story. You click on a story and scroll down to read it but it suddenly goes down as you read it. Fix your video. Commercials play during videos. Thank you for making a great update on the app. Works great and easy to navigate. Great alerts news weather updates. And it’s updated often many of the news apps don’t update the news in a timely manner. Please fix the glitches: adds seem to play at the same time as news videos. Makes it difficult to hear and watch. VERY ANNOYING!!! Why do we have to see an ad for every news report!!!! This problems are unfortunately gonna make me leave this app and look for another!!! Please FIX!!!! All of the sudden there is an internet connection message. Everything else is working and connected but this app. Can’t get any news. I was Born in California and grew up with channel 7 eyewitness news as a teenager I remember watching Christine Lund as one and the news casters and I continue to watch it today even though in 2010 I move to Pocatello Idaho our news is not nearly as professional and lacks giving information of other parts of the world. I watch channel 7 eyewitnesses news every day. App worked fine for a while then suddenly starts showing Error message with no information as to why. Update of app didnt help.